Does you little one have a security item that they can't get through the day (or night) without? My children have never had a security item as babies, but security blankets are very popular among infants and children. Blanket My Baby has an adorable selection of personalized baby blankets, swaddling and security blankets, stroller blankets and more. 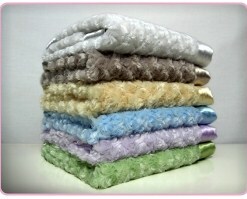 They carry adorable baby blankets in a variety of sizes and colors. Many parents have discovered the wisdom of buying two or more of their child's favorite security item - one for baby to snuggle with while the other in getting washed. Maybe you need one for home, in the car and at grandma's house? Baby Lovie® is a super soft security blankie with silky satin picture frame border - perfectly sized for little hands, and features textures that little fingers love to touch and explore. Pediatricians recommend that a young child 6 months and older be given a security object. This small security blankie helps comfort and soothe small children. When parents keep Baby Lovie close to their skin for several hours, it will absorb parent's scent which will help baby bond with this sweet security blankie. A super soft security blanket with textures that little fingers love! The thing I love most about the Baby Lovie is that it is super soft. I'd love to have a full size one that I could cover up with when it's cold! It's so soft that once you feel it, you start rubbing it and don't want to stop! It really is that soft! These adorably soft security blankets are the perfect gift for any baby shower. Disclaimer: I received a complimentary Baby Lovie security blanket from Blanket My Baby for the purpose of writing a review and hosting a giveaway. Regardless, I only recommend products or services I use personally and/or believe will be a good fit for my readers. The views and opinions expressed on this blog are purely my own. Results may vary. No monetary compensation was received. I like the Lavender Purple. I like the kiwi green. I would choose the Sterling blanket. the light blue with chocolate brown. I love the Sage Green! Thanks for the cool giveaway! I would choose the Kiwi Green! I would pick Chocolate brown. green - until we find out our baby's gender! thanks! I would love the Chocolate Brown! I would choose the Sage Green or Sterling Baby Lovie...I haven't made up my mind. Thanks for the giveaway! I would choose the Sterling! Very cute.